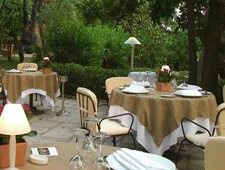 Le Moulin de Mougins put the city of Mougins on the world’s culinary map. : History was made at Le Moulin de Mougins when Roger Vergé invented “La Cuisine du Soleil” (“The Cuisine of the Sun”). Now, chef Erwan Louaisil is at the helm of this famed restaurant located in a mill that dates back to the 16th century. Outside is a pleasant veranda and a terrace that basks in the shade of olive trees and cicadas. Lunchtime offers two prix-fixe menus---“Un Déjeuner au Moulin” (€ 49) of starter, main course and dessert, and “The Business Menu” (€ 39), including main course, dessert, glass of wine and espresso, which is designed to be served in under an hour. In the evening, diners have their choice of the Menu Découverte (€ 90), Menu Dégustation (€ 120) or Menu Carte Blanche au Chef (180 €). The latter option allows Chambru to present dishes inspired by the seasonal bounty of the market, in addition to classics such as Vergé’s zucchini flower stuffed with mushrooms flavored with black truffle. Guests might also encounter John Dory with holly eau-de-vie and chicory coulis or roasted Wagyu beef accompanied by polenta made with carrot juice. Desserts such as almond sponge cake with poached pear and maple syrup sabayon conclude the meal. Every month, sommelier Franck Thomas hosts a special multi-course wine dinner featuring various French wineries.